Here are all the stats and numbers that were created during the final ball thriller. The Nidahas Trophy came to an end in a dramatic fashion with Dinesh Karthik hitting the final delivery for a six when India needed five runs. Karthik scored 29 in just nine balls after coming to bat when they needed 34 runs to win from the final two overs. India cruised in the 167-run chase thanks to a fifty at the top from Rohit Sharma. But the pressure in the middle overs due to the dot balls brought down the equation tricky for them before Karthik pulled off a thriller. 4/18 – Yuzvendra Chahal’s bowling figures of 4/18 in this game are the 2nd best in a T20I knockout by an Indian. Irfan Pathan registered figures of 3/16 against Pakistan in the WT20 2007 final. 5 – Runs India needed before the final delivery of the final over. No other team successfully chased down more than one run on the final delivery of a Twenty20 final. 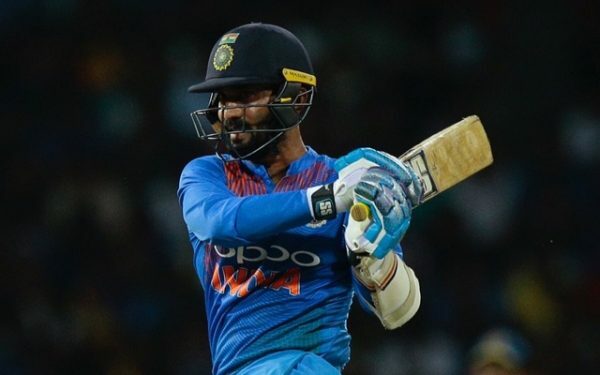 7 – Since his comeback to the International cricket in 2017, Dinesh Karthik has been part of seven successful run chases (3 ODIs and 3 T20Is). He remained unbeaten in all those seven chases. 8 – Number of times Mahmudullah got run out in the T20I format. These are the joint most times any player got run out in T20Is. Kane Williamson and Samiullah Shenwari also have eight runout dismissals apiece in T20Is. 13 – Innings KL Rahul needed for completing 500 runs in the T20I format; the quickest to the milestone. Aaron Finch was the previous quickest to get to 500 T20I runs taking 14 innings. 16 – Number of fifty-plus scores for Rohit Sharma in the T20I format. Only Virat Kohli (18) scored more fifty-plus scores in the format than Rohit. Martin Guptill also scored 16 fifty-plus scores in T20Is. 48 – The 48 runs by Vijay Shankar are the joint most conceded by an Indian in a T20I knockout. Ravindra Jadeja also conceded 48 runs in the 2016 WT20 semi-final against West Indies. The previous most runs conceded by an Indian in a T20I final are 44 runs in the 2007 WT20 final against Pakistan by S Sreesanth. 77 – Sabbir Rahman’s 77 is the highest individual score for Bangladesh in a knockout game in International cricket. Mahmudullah’s 76 in the recent ODI Tri-Series final against Sri Lanka is their previous highest. 167 – India’s 167-run chase is the highest successful chase for any team in a T20I final. West Indies’ 156-run chase in the 2016 WT20 final against England was the previous highest successful chase in the T20I final. 7030 – Rohit Sharma became the 3rd Indian player after Suresh Raina (7378) and Virat Kohli (7095) to complete 7000 runs in the Twenty20 cricket. Rohit is overall the 10th player to score 7000 Twenty20 runs.